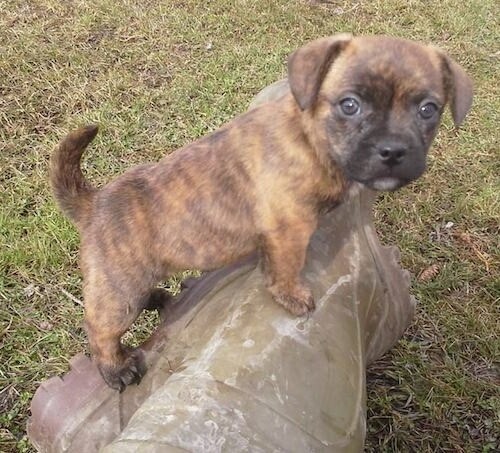 Molly the French Bull Jack (French Bulldog / Jack Russell Terrier mix) as a puppy at 8 weeks old—"Molly is a gorgeous brown brindle French Bull Jack with the awesome qualities of both her breeds! Outside she is playful and is already responding to basic commands of come and stay! Inside she is like the Bulldog, a snuggly lap potato that just wants to sleep! The best of both worlds in one adorable puppy!" The French Bull Jack is not a purebred dog. It is a cross between the French Bulldog and the Jack Russell Terrier. The best way to determine the temperament of a mixed breed is to look up all breeds in the cross and know you can get any combination of any of the characteristics found in either breed. Not all of these designer hybrid dogs being bred are 50% purebred to 50% purebred. It is very common for breeders to breed multi-generation crosses.